Shri E.S.L. Narasimhan, the Governor of Telangana, officially inaugurated the new section of Hyderabad automated metro, with the first passenger service in the direction of Hitec City. The new 10-km section, served by 8 stations, connects the city on west-east axis, from Ameerpet to Hitec City. This new section serves a major business district (Hitec City) where numerous IT and international pharmaceutical companies are located. As well as the competitivity gains this mode of transport brings to the megalopolis, it is also predicted to significantly reduce road traffic in this part of the city which is regularly congested during peak hours. The opening of this section of the metro is expected to double the number of passengers across the network. In 2012, L&T Metro Rail (Hyderabad) awarded Keolis Hyderabad the contract for the metro operation services. Since the network opened in November 2017, it has provided over 50 million passenger-journeys. Once completed, the network will be 67 km long and is expected to carry more than one million passengers per day. “This section opening represents yet another important milestone for the Hyderabad metro. engineering project, the largest Public-Private Partnership in the world,” said Bernard Tabary, International CEO, Keolis Group. On the new section, the metros run on according to the ‘twin single-line’ model, with each track capable of being used in either direction. 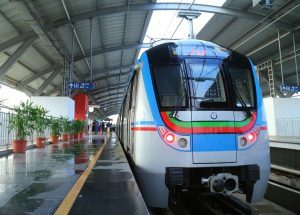 This operational mode, made possible by the CBTC technology on which the Hyderabad metro system is based, will be used until the construction of the crossover track beyond Hitec City station. In November 2017, Hyderabad first metro section was put into commercial operations. The 30 km line is running from Myapur to Ameerpet and on from Ameerpet to Nagole. In September, the second metro section was opened, linking Ameerpet to LB Naga on a 16-km line with 16 stations.